Looking for advice on natural health and wellbeing? Your local independent health store can offer a wealth of knowledge and expertise. This month we speak to Tim Hutchin, health food shop manager at G Baldwin & Co in London. For example, honey can be used as an effective wound dressing. Manuka honey is used for dressing chronic and infected wounds in NHS settings. One of the most traditional health benefits of honey is in the treatment of sore throats and it really does work. There is also some evidence that suggests honey may also work as a cough suppressant. One or two teaspoons before bed can help to prevent coughing during the night as the honey soothes and calms. Honey can also help with easing the symptoms of hayfever and we receive a lot of interest from our customers around this. All good quality honey, such as cold-pressed or raw honey, will have many active ingredients that can help to ease symptoms. However, honey is unsuitable for children under 12 months due to the presence of botulism bacteria in some varieties. All types of honey have antibacterial properties, although some will have more than others, and this is dependent on what the bees have been feeding on. For example, if bees have been fed exclusively on heather, this boosts the antibacterial properties of the honey. The essential differences come down to flavour, consistency, colour, taste and price. Another aspect to consider is how the honey has been processed and whether it has been blended, heat-treated (to maintain runniness during packing) or if it has been pasteurised, as this removes some of the health benefits. We would recommend going for a honey that is a single blossom or one that is cold-pressed and is unpasteurised. As a general guide when buying honey, the lighter the colour, the lighter the taste will be. Manuka honey is more of a therapeutic honey and it has extra benefits due to the bees feeding on the pollen and nectar of the flowering manuka tree. When buying manuka, there are two types of ratings that will be displayed on packaging. These are designed to assure purity and quality. The unique manuka factor (UMF) rating is a gauge of the honey’s non-peroxide activity (NPA) which is used to assure authenticity and highlight the level of antibacterial properties. The MGO rating is the manuka honey’s level of methylglyoxal, a key compound that has antiviral properties as well as antibacterial. These two ratings also provide guidance on the strength of the honey. As a rough guide, a 10+ UMF rating can be compared with a 100+ MGO rating. It can be quite confusing for customers and staff are more than happy to help and provide advice. As demand for manuka honey has risen over the past few years, this is now sadly reflected in the significant price. Bees are amazing creatures and we use everything that they can provide for us including venom, honey, wax and propolis. We should do everything that we can to support them. 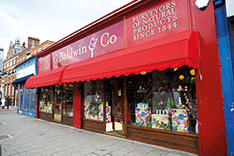 Established in 1844, G Baldwin & Co is London’s oldest and most established herbalist. The family-run business originally started life as a traditional Victorian herbalist, and still retains many of those features today. It is a one-stop-shop for all health needs. It is split into two shops, next door to one another, the traditional herbal aspect remains plus a more contemporary health food shop. The health food shop offers regular tastings and consultations with a nutritional adviser, while the herbal shop offers a weekly drop-in clinic with a qualified herbalist.